Roman metal keys and latch lifters excavated from the City of London. Image copyright Museum of London. Archaeologist Tatiana Ivleva explores Roman glass bangles on both sides of Hadrian's Wall in this new display. This new display focuses on Newcastle University archaeologist Tatiana Ivleva's research on Roman glass bangles in Britain. The exhibition puts a peculiar artefact from Roman Britain into the spotlight: a glass bangle, seamless ring-shaped adornment made of coloured glass. It examines the arrival of glass bangle technology in Britain and their popularity in the frontier region of the province, and discusses the various functions bangles may have had. The exhibition includes also real-size reconstructions of the glass bangles, made in collaboration with National Glass Centre in Sunderland and glass artist Connor Garton. 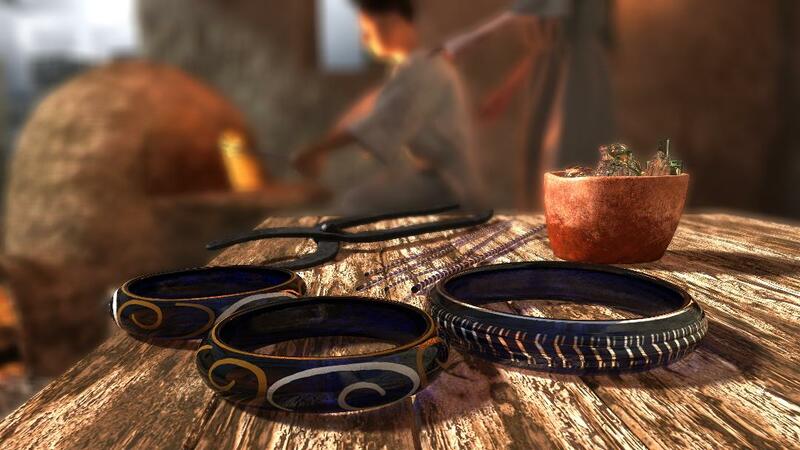 Of particular interest are 3D reconstructions of complete glass bangles from two small fragments from Vindolanda Roman Fort and Corbridge Roman town. A highlight is a short film on how to manufacture a seamless glass bracelet. 'The Roman Frontier: Stories beyond Hadrian's Wall ' gallery is a permanent exhibition which showcases Tullie House Museum and Art Gallery’s significant Roman collections, along with items on loan from the British Museum. It opened in June 2011.